March 13: Casino Royale (2006, DVD & Blu-ray) Daniel Craig is the best and the booziest of the Bonds. March 20: The W.C. Fields Comedy Collection Volume 2: The Man on the Flying Trapeze / Never Give A Sucker An Even Break / You’re Telling Me! / The Old Fashioned Way / Poppy (1934-1941, DVD) If you only buy one DVD set this year, this better be it, Chester! 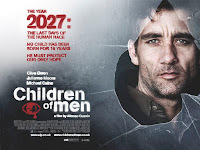 March 27: Children of Men (2006, DVD & HD-DVD) Although Clive Owen’s character likes to drink, I wouldn’t call Children of Men a booze movie. Still, it was the best damn film of the past year, so it’s worth a mention. May 22: Smokey and the Bandit (1977, HD-DVD) As cheaply as this flick was produced, I don’t know how much the high definition upgrade will help. Glorious news! The editor of Modern Drunkard Magazine checked out the Booze Movies blog and invited me to write a regular film column for the illustrious periodical. The column will cover the same territory as this site--reviews, news, and features spanning the history of soused cinema. However, that doesn’t mean that Booze Movies is going away. If anything, there will be more inebriated exchanges between liquor-centric film fans, as the magazine drives more traffic to the site. I will try to keep to my schedule of a posting a couple of new reviews each week. However, I want to make sure the majority of each column consists of material that has not appeared on the blog (there will be some overlap). Consequently, I may post less content on the weeks in which I’m preparing material that will premiere in MDM. The first column is a mixture of the old and the new. My review of Withnail and I is the old, but the column will also feature a new review of a flick similarly centered around drunken camaraderie. I won’t reveal the movie’s title here, but if you know your film history, the photo that accompanies this post is a dead giveaway. The magazine is going to press on Monday, so my first column should be hitting the newsstands soon. However, if you can’t find MDM at a store near you, subscriptions can be obtained at drunkard.com. If you enjoy the content here at Booze Movies, you’re sure to love the rest of the potted prose that fills each issue. After all, some of the world’s best writers have been hoochhounds. Now, I think I’ll enjoy a celebratory drink. No list of liquor-laced cinema would be complete without the inclusion of the Rat Pack. However most of the flicks that Frank and the boys churned out as a team lack the fizz and swagger of their historic nightclub act. Apart from Dino’s unforgettable rendition of “Ain’t Love a Kick in the Head,” Ocean’s Eleven (1960) is a bit of a snooze, and the warmed-over Gunga Din remake Sergeant’s 3 (1962) is best forgotten altogether. 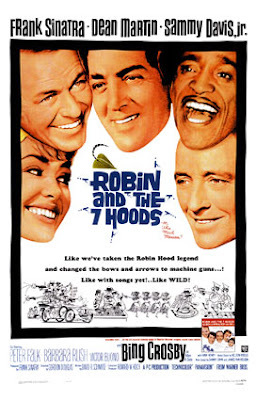 That leaves Robin and the 7 Hoods, which is easily the giddiest of the Rat Pack’s efforts on screen. More importantly, it’s the tipsiest. Overall, this is a light, frothy cocktail that goes down pleasantly. However, it doesn’t pack the punch one would expect based upon the ingredients that went into it. Intoxicating Effects--None. The Pack hold their liquor with class. Potent Quotables--JOHN: (Upon finding the smashed remains of the speakeasy) A hundred thousand hangovers down the drain. Video Availability--Robin and the 7 Hoods is available as a solo DVD or as part of The Rat Pack Ultimate Collectors Edition (Warner Brothers). Similarly Sauced Cinema--Frank and Dean put away the booze like pros in their first film together, Some Came Running (1958). Kate Hepburn portrays Tracy Samantha Lord, a cold fish divorcee of the socialite set in 1940’s The Philadelphia Story. 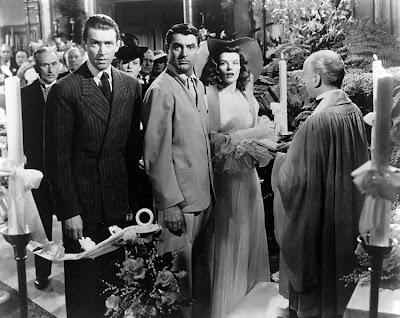 The film centers around Tracy’s impending second wedding, which is complicated by the arrival of her first husband (Grant) and a couple of society reporters (Stewart and Hussey). With the help of the unexpected guests and buckets full of bubbly, Tracy learns a few things about herself and about the man she is about to marry. Hepburn had a tremendous hit on Broadway with The Philadelphia Story, and she slyly bought the film rights to assure that she would play the part in the movie version. She was also allowed to hand-pick her co-stars, and she selected the best of the best in Grant and Stewart. Although this is truly Hepburn’s movie, Jimmy Stewart completely steals the film as a fish-out-of-water journalist. His drunken scenes in the picture’s second half are not only laugh-out-loud hilarious, they are the primary reason I’d recommend the film. 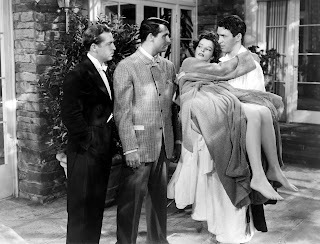 To be sure, The Philadelphia Story is a classic of the cinema, soused or otherwise. However, I’d argue that it’s a minor classic. The film is nowhere near as fun as the dizzy romantic comedies in which Hepburn and Grant had previously starred, and the theatrical origins of the story are obvious in its talky, overwritten dialogue. The film also commits the cardinal sin of hiring Cary Grant, the finest light comedian the movies ever produced, and giving him too little to do. Worst of all, Hepburn’s character is such a spoiled snot that it’s difficult to understand why her leading men are so spellbound by her. Still, I have to admit Tracy Lord doesn’t seem half bad when she’s fully sozzled on champagne. Potent Quotables--CONNOR: Is that an alcoholic beverage? DEXTER: No, it’s for Tracy. Why, do you want one? CONNOR: Listen, I’d sell my grandmother for a drink. You know how I love my grandmother. DEXTER: Well, Uncle Willie’s around in the pantry doing weird and wonderful things. Tell him I said one of the same. CONNOR: Mind if I make it two? DEXTER: That’s between you and your grandmother. Similarly Sauced Cinema--Bing Crosby and Frank Sinatra share cocktails and a fascination for Grace Kelly in High Society (1956), the musical remake of The Philadelphia Story. The critics were right in stating that the film version of Fear and Loathing in Las Vegas is noisy, rambling, and excessive, but then again, so was the book. In fact, intemperance, greed, and personal gratification are what the piece is all about. Hunter was arguing that those narcissistic values are what truly lie at the core of the “American Dream.” The drug-addled hedonists at the center of the story are no worse (or no better) than the middle-class hoards that come to Vegas to try to get rich quick and debauch. The film succeeds both as a hilarious shaggy dog story--because no one could actually ingest as many weird chemicals as Duke does and live, let alone write--and as a sad commentary on the failure of 60’s drug culture and American society as a whole. Depp and Del Toro masterfully disappear into their roles, and Gilliam’s psychotically psychedelic visuals add to the fun. Best of all is the script, which wisely lifts much of the dialogue and narration word-for-word from the original text of the book, because no performance or special effect could ever be as wild as Thompson’s own gonzo prose. Of course, this is really more of a drug movie than a booze movie, but there is also plenty of liquor in evidence. After all, you have to use something to wash down the pills. Potent Quotables--RAOUL DUKE: Those of us who’d been up all night were in no mood for coffee and donuts. We wanted strong drink. We were, after all, the absolute cream of the national sporting press. Similarly Sauced Cinema--Johnny Depp revisited the world of Hunter S. Thompson in Bruce "Withnail & I" Robinson's adaptation of The Rum Diary. 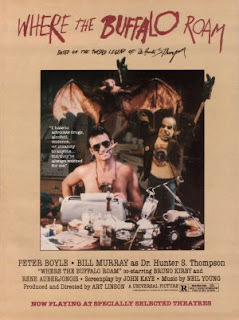 Hollywood first attempted to bring the bizarre world of whiskey-slugging, pill-popping, gonzo journalist Hunter S. Thompson to the screen with 1980’s Where the Buffalo Roam, starring Bill Murray as Thompson and Peter Boyle as Carl Lazlo. 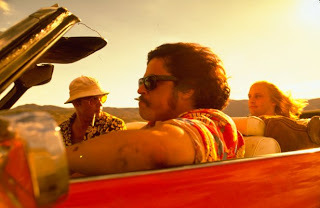 The film centers on Thompson’s relationship with Lazlo, a part-time lawyer and full-time radical based loosely on Hunter’s friend Oscar Zeta Acosta, who joined Thompson on the famous road trip depicted in Fear and Loathing in Las Vegas. After Acosta disappeared during a trip to Mexico, the real Hunter wrote a farewell article to his friend for Rolling Stone, entitled "The Banshee Screams for Buffalo Meat." That article provided the primary basis for this film. However, the screenwriter also threw in bits borrowed from Thompson’s other writings, including "Fear and Loathing at the Superbowl" and Fear and Loathing on the Campaign Trail ’72. It might have been better if the filmmakers had concentrated on a single piece, because the resulting picture is an incoherent mess. 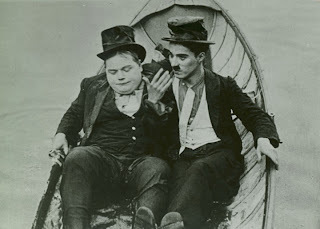 Jumping through three loosely connected flashbacks in the lives of Thompson and Lazlo, Where the Buffalo Roam generates few laughs and fails to provide any genuine incite into the relationship between the two men. Worse yet, the tone of the film shifts wildly from serio-comic realism to frat boy slapstick. Still, while this is not a good film, it is an interesting failure. 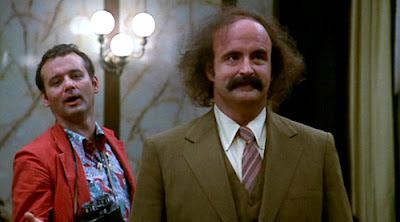 Murray is surprisingly decent as Thompson, and his understated performance occasionally captures glimmers of Thompson’s paranoid charisma. Also, it’s hard for me to completely dismiss any film that features a hospital IV tube attached to a bottle of Wild Turkey. Potent Quotables--THOMPSON: I hate to advocate drugs or liquor, violence, insanity to anyone, but in my case it’s worked. Video Availability--The studio didn’t want to pay the licensing fees for many of the songs on the original soundtrack, so music by Hendrix, Dylan, the Temptations, and others has been replaced on the Where the Buffalo Roam DVD (Universal). However, the film occasionally runs on cable with the original soundtrack intact. 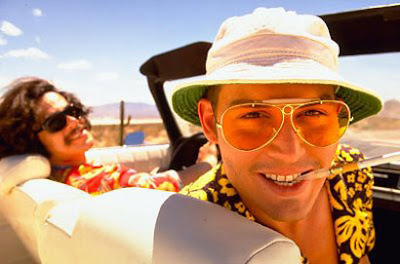 Similarly Sauced Cinema--Johnny Depp and Benicio Del Toro portrayed Raoul Duke and Dr. Gonzo, the fictionalized versions of Thompson and Acosta, in Fear and Loathing in Las Vegas (1998). If asked to name the greatest boozing action hero in cinematic history, most people would answer without hesitation “Bond, James Bond.” However, they’d be dead wrong. Mr. “Shaken not stirred” has done little over the course of his first twenty films to earn his 100 proof reputation. Let’s face it; 007 is a cocktail sipper at best. Wong Fei-Hung, on the other hand, is a champion with a heroic capacity for alcohol to match his fearless attitude in the face of danger. This legendary Chinese folk hero had been depicted in numerous films before Jackie Chan offered an inebriated take on the character with 1978’s Drunken Master. 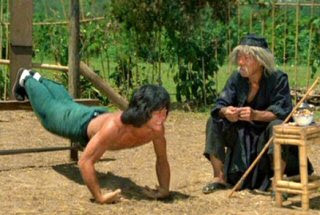 Actually, the drunken master of the title is Fei-Hung’s uncle, Su Hua-Chi (Yuen Siu Tien), a renowned martial arts master and wino, to whom the young Fei-Hung is sent as a punishment after disgracing his family. Under the old man’s tutelage, Fei-Hung learns the secrets of drunken boxing, a style of Kung Fu that imitates the groggy motions of a lush. This method of fighting is most powerful if the user first gets pig-stinkin’ drunk, just as Popeye is at his most potent with a stomach full of spinach. Of course, Fei-Hung is only too happy to adhere to the booze-makes-you-stronger rule of battle. With this new knowledge and a bellyful of 100 proof wine, Wong Fei-Hung saves his family from a hired assassin and emerges as a new drunken master. It may be difficult for today’s audiences to understand how this modest kung-fu comedy propelled Jackie Chan to superstardom. Compared to his chock-socky classics from the 1980’s, the action sequences in Drunken Master appear slow and stagy, and the comedy rarely rises above the level of “juvenile.” However, at the time of the flick’s original release, this mixture of martial arts, comedy, and hyper-powered hooch was something new and exciting in Hong Kong cinema. 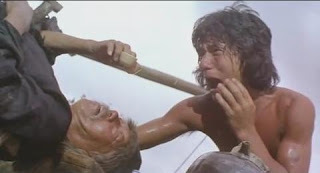 Drunken Master not only made Jackie Chan a star, it spawned numerous copycat films and semi-sequels. It also laid the groundwork for Jackie Chan’s greatest kung-fu epic, 1994’s Drunken Master II! Potent Quotables--Su Hua-Chi: To study my style, you’ll find it easier if you have a drink first. Similarly Sauced Cinema--Yuen Siu Tien returned to the part of Su Hua-Chi for Dance of the Drunk Mantis (1979), Story of the Drunken Master (1979), and World of the Drunken Master (1979). However, Jackie Chan didn't return to the role of Wong Fei-Hung until 1994’s Drunken Master II (a.k.a. 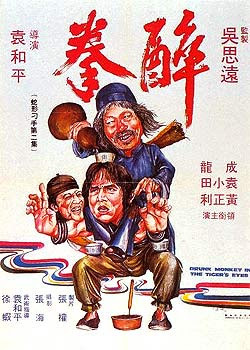 The Legend of Drunken Master). Long before Felix the Cat used his magical “Bag of Tricks” to foil the nefarious plans of the Professor, Rock Bottom, and the Master Cylinder (Anyone else grow up in the 70’s?) he got bombed out of his skull in the silent short subject Felix the Cat Woos Whoopee. The plot of the cartoon is simple--Felix carouses until 6 a.m. at the Whoopee Club, chugging beer, wine, and anything else he can lay his hands on, while his wife waits up impatiently with a rolling pin. As the fuddled feline teeters home, monstrous hallucinations block his path, including dragons, a winged ape, and a walking trombone. It’s a toss up as to whether the missus or Felix’s own imagination poses a greater threat to his well being. 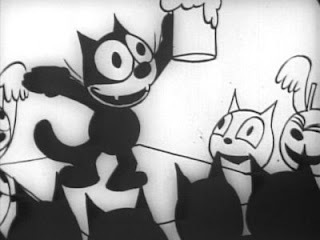 Despite the fact that the animation used in the Felix the Cat shorts was primitive and that any kind of narrative flow was virtually nonexistent, the famous feline was the most popular cartoon character of the silent era. Felix’s appeal lay in that he lived in a surreal world where anything could happen--buildings could dance, one object could morph into another, and Felix himself could change shape on a whim. This bizarre, dreamlike style lends itself well to the woozy narrative of Felix the Cat Woos Whoopee, and it is likely that modern viewers will be surprised at how much they enjoy Felix’s drunken antics. Like fine Scotch, this cartoon has aged remarkably well. Potent Quotables--There’s no dialogue in this one. The pictures speak for themselves. Video Availability--Available in the collection, Felix! Felix the Cat 1919-1930 Collection (Slingshot). 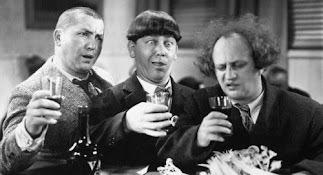 Similarly Sauced Cinema--Felix inadvertently gets mashed on moonshine in Felix Finds Out (1924). Also, the hallucinatory section of Woos Whoopee anticipates the “Pink Elephants on Parade” sequence in Dumbo (1941). Vincent Price has one of his funniest roles as Waldo Trumbull, a perpetually pickled undertaker with a nasty disposition, in the AIP horror farce, The Comedy of Terrors. When Mr. Black (Basil Rathbone) threatens to shut down Trumbull’s funeral parlor due to unpaid rent, the wine-sodden mortician hatches a proactive plan to increase business. With the questionable help of his accident-prone assistant (Peter Lorre), Trumbull puts the murderous enterprise into action, dispatching townsfolk while simultaneously killing a bottle. Eventually, the pair target Mr. Black when Trumbull realizes he can funnel all his profits into booze rather than paying off the old skinflint. Unfortunately, the landlord proves harder to kill than Rasputin. Price gets to play drunk for nearly the entire running time of the film, and what a marvelously loathsome, acid-tongued alky he makes--insulting his wife (Joyce Jameson), barking orders at Lorre, and offering “medicine” (actually poison) to his doddering father-in-law (Boris Karloff). The rest of the all-star cast is also in fine form. 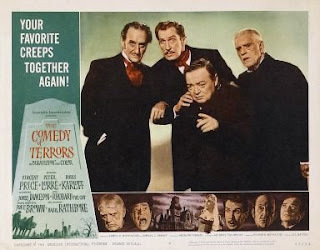 Lorre is at his cuddly, pug-puppy cutest; Karloff is note-perfect as a semi-senile old coot; and Rathbone is hilarious as the murder victim that refuses to stay stiff. 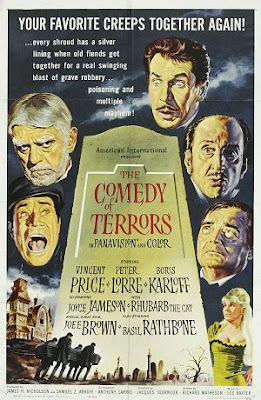 Occasionally Richard Matheson’s witty script is undermined by ham-fisted direction that overplays the slapstick with under-cranked, fast-motion photography (look for the stuntman in the Peter Lorre mask), but overall The Comedy of Terrors is an amusing, surprisingly smart little movie. Potent Quotables--AMARYLLIS: Only a man who drinks could talk like that. WALDO: We escape the unendurable however we can. AMARYLLIS: How I despise you! Similarly Sauced Cinema--Peter Lorre plays a souse who challenges a vino connoisseur (Vincent Price) to a wine tasting duel in Tales of Terror (1962).